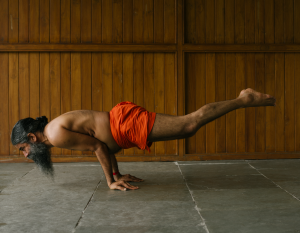 Baba Ramdev – Billionaire Yogi – Zero Equals Two! “We strolled along a brick path to a small bungalow, and there was Ramdev, seated on a beautifully carved wooden swing, laughing and chatting with a guest. He rose and greeted me with a hug. I was struck by his slight stature; his bushy black beard, gray at the fringes, seemed more substantial than his thin frame. He emanated a loose-jointed warmth, like someone who has just run a long distance. Apart from his thin saffron robes — one wrapped around his chest and one at the waist — he wore only padukas, the traditional platform wooden clogs with a metal post for the toes to grip.